Fenzi Dog Sports Academy - EasyBlog - E105: Sue Yanoff - "What's RIGHT with Your Dog?" The joke says that everything is fun and games until someone ends up in a cone - but what can you do to help reduce the risk of injury - and help tell when something is actually wrong? Sue Yanoff, DVM, shares all that and more for us on today's podcast. Today we'll be talking to Sue Yanoff. Sue graduated from Cornell University College of Veterinary Medicine in Ithaca, New York, in 1980. After three years in private practice, she joined the U.S. Army Veterinary Corps. 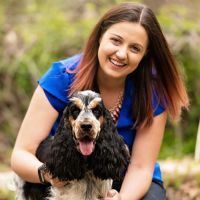 While on active duty, she completed a three-year residency in small animal surgery at Texas A&M University and became board certified by the American College of Veterinary Surgeons. She retired from the Army in 2004, after almost 21 years on active duty. After working for a year on a horse farm in Idaho, she returned to Ithaca to join the staff at Colonial Veterinary Hospital as their second surgeon. She retired from Colonial in December 2009 — her on-call schedule was interfering with those dog show weekends! The following month, she started working for Shelter Outreach Services, a high-quality, high-volume spay-neuter organization. About the same time, Sue joined her colleague, a physical therapist and licensed veterinary technician, to start a canine sports medicine practice at the Animal Performance and Therapy Center in Genoa, New York. The practice is limited to performance dogs. She also teaches a class on Canine Sports Medicine for Performance Dog Handlers here at FDSA. Sue Yanoff: Hi Melissa. It's good to be back. Melissa Breau: So I think most people who participate in dog sports worry about injuries — but maybe they don't give it a ton of thought until it actually happens. Are injuries just sort of an inevitable part of dog sports? Sue Yanoff: I don't think they're inevitable, but they are common. It depends a lot on the sport. There are some sports that are a lot more stressful on the dog's body than other sports. We think about agility and field trials and herding and now coursing. That's a lot of stress running full speed. So I don't think they're inevitable, but they are common. I think they're more common in certain breeds, and there have been papers published that show a breed predilection, although they're retrospective studies and not strong science. But we all know that there are certain breeds that tend to be harder on their bodies and have a less sense of self-preservation than other breeds, and I don't think I have to mention the breeds. Also the more you do with your dog, the more likely they are to be injured. So they're not inevitable, but they are common, and I think one of the most important things is to catch them early. Melissa Breau: What are some of the less obvious signs that maybe something is going on or is going wrong? Sue Yanoff: I think there are a lot of signs that are less obvious. If your dog is limping, I don't think that's very hard to miss. But there's a term we use in veterinary medicine. We call it ADR: Ain't Doing Right. Sometimes the dog you know isn't quite right, but you don't know really what's wrong. It's harder to pick up in pet dogs, but in our performance dogs we see things like slower times in agility, or knocking bars, or refusing jumps, popping the weaves or not hitting the entries of the weaves. In obedience dogs, they might run around the jump instead of taking the jump. So there are some subtle signs that a dog can show that we often blame as a training issue and don't really think that maybe the dog doesn't feel good or maybe the dog is in pain. I think, in performance dogs, anything that affects their performance, you really have to think, Is the dog injured or is the dog ill? Melissa Breau: To feed on that, there are a lot of times when a dog just seems a little off, and the handler maybe isn't sure if it's just that occasional bad day, or if there's something bigger going on. Are there things they can do at home that would help them decide whether something is serious enough that a vet needs to be involved? Sue Yanoff: I guess if it's something subtle like that, where the dog just seems off, I might give the dog a day or two off of no training, no competing, just relaxing and getting to do what they want to do, and then see if the dog gets better. If the dog doesn't get better, then that might be the time to think about seeing the vet. If the dog does get better, and then goes back to training and competing, and then seems off again, then I think that's another good time to go see a vet. Melissa Breau: I've seen quite a few Facebook posts from handlers who maybe take their dog to the vet, the vet does a workup, they can't find anything wrong, but the dog still seems off to their handler or their owner. Do you have any advice? What should they do in that kind of a situation? Sue Yanoff: I think most people, the first vet that they go to is their general practitioner, which is fine. I think being a general practitioner is the hardest job of all vets. When you're a specialist, you specialize in one area, and you know a lot about that particular area, but not necessarily everything. I used to be a general practitioner, so you have to know a little bit about everything, and you might not be as good at certain things as other things. When I do an orthopedic exam or a sports medicine exam, I spend a lot of time with that dog. I examine all four legs. I do a lot of things that a general practitioner, for one, doesn't have time to do in a 20- or 30-minute appointment, and two, might not have the training or the experience to do. So I think the general practitioner is a good first place to start, but if they can't find anything with your dog and you still think there's something wrong with your dog, then it's time to go further and look for somebody that specializes in sports medicine, orthopedic surgery, or even has a certification in rehab. A specialist like that might not be available to everybody close by. I know my clients travel four to five to six hours to go to see an orthopedic or a neurologic specialist that I send them to. But if your general practitioner can't find anything, they often will recommend that you rest your dog, give them NSAIDs — non-steroidal anti-inflammatory drugs — and again, that's a good first start. I have no problem with people taking a week or two to rest their dog and give them some pain medications. But if you want to pursue it, or your dog doesn't get better, or if your dog does get better, and then as soon as you start doing more with your dog, they start having problems again, then you have to go see a specialist. You can Google American College of Veterinary Surgeons, you can Google American College of Veterinary Sports Medicine and Rehabilitation, and you can try to find somebody that either has experience with orthopedic surgery and sports medicine exams or somebody that actually has training in sports medicine. Now I have to say that doesn't guarantee that that person will be good and that that person will be able to find out what's wrong with your dog, but at least they've got additional training and experience. And then there are veterinarians, general practitioners, who are interested in sports medicine and rehabilitation who can't or won't do a residency, which is an intense three-year training program, but they can get a certification in rehabilitation and at least get some extra training experience. So the next step after your general practitioner would be to seek out a specialist. Melissa Breau: You mentioned in there that sometimes that can involve quite a bit of driving. In that kind of case, is it usual that maybe you go there, you get a firmer diagnosis, and then you can work with your own vet, or is that one of those things where you need to work with them on an ongoing basis? Sue Yanoff: It depends what it is. The practice that I send my clients to, we have an agreement that if my clients tell them ahead of time, "I'm coming from central New York and it's a long drive," they will schedule the exam on one day, and then they will save a spot to do some advanced diagnostic tests that afternoon, if indicated, and then they will also save a surgery spot for the next day, in case the dog needs surgery. So they are very good about working with my clients. If you are driving that far, then you need to talk to the specialist ahead of time, let them know that you're driving from far away, and see if they will accommodate you like that. A lot of practices will see the animal, do the exam, do any diagnostics like X-rays or ultrasound, and then schedule the surgery for the next week or the week after, which means that the client has to go home and then drive back. So the best advice would be to talk to the specialist, or the receptionist or technician, whoever you're talking to, and see if they can work with you as far as scheduling. Melissa Breau: Are there common things that sports dogs tend to injure, or common injuries that they tend to suffer from? Sue Yanoff: I think the most common injuries are sprains and strains. A sprain is an injury to a ligament, and there are different severities of sprains. A strain is an injury to a muscle, and again, there are different severities, depending on how much damage there is to the muscle or the ligament. Those are probably the most common. It's not common for a dog to fracture a bone doing a sport, although it is possible, but it's not common. So sprains and strains. In my practice and from what I've read, we've all heard of iliopsoas muscle strains. Those are common, although I think as they become more well known to veterinarians, I think in some cases they're a bit over-diagnosed. Shoulder injuries are common, and there are several structures in the shoulder that can be injured. There are ligament sprains and also muscle strains in the shoulder. Cruciate ligament injuries – while cruciate ligament tears are not common in sports as far as actually training in or competing in the sport, they are common injuries in sport dogs, and you can have a cranial cruciate ligament sprain where the ligament is stretched but not torn that is hard to distinguish from a partial tear of the cranial cruciate ligament. Also I see a few toe injuries in sports dogs, especially in field dogs and herding dogs that are running over rough terrain, and also agility dogs that can jam their toes on the equipment. Toes are often overlooked when veterinarians do an exam, so I always pay close attention to the toes. Melissa Breau: I know I mentioned in that first question that a lot of handlers don't think much about injuries until they happen, but I know there are also quite a few people — especially in our audience — who ARE worrying about it. They spend a lot of time on conditioning exercises and they always warm up and cool down their dogs. I'd love to hear what we know about the impact of including those types of things in a dog's routine. Do we know whether or not it helps prevent injury? Sue Yanoff: To answer the last question first, no, we don't know if it helps prevent injury, because those studies have not been done. Now, in human athletes, we know that conditioning and warm-up and cool-downs not only help prevent injuries, but also improve performance. So I see no reason to believe it would be different in dogs, so I and I think everybody who teaches anything associated with conditioning at Fenzi agree that keeping your dog conditioned, which is not just exercises but everyday life, and taking them for walks and hikes, and the training that you do with them, those are all important. Also in the realm of conditioning exercises, avoiding the "weekend warrior" syndrome, where you do nothing with your dog all week, and then you take them out and compete on the weekend. I don't think a lot of people do that, because we really can't compete unless we're training our dogs, but then you can think about dogs that are already trained and really don't need a lot of training to maintain their performance. I don't think it's a great idea to not do anything with the dog all week and then go out and compete on the weekend. So conditioning is very important, I think, to help prevent injuries, and then also warm up and cool down. Lori Stevens and I both recently did webinars on preventing injuries and warm up and cool down, so while that information is not available to anybody that didn't take the webinars, it is out there. And then I just want to talk a little bit about this. I talked about it in my webinar and it might not be important, but it did come up once on the Fenzi alumni Facebook page, and that is prevention versus reducing risk. It's a bit of semantics, but when we say "preventing," that means that the dog's not going to have any injuries at all, and like we talked about at the beginning, that's probably not likely. If you're very active, you're probably going to hurt something at some point. It doesn't mean it's going to be serious injury that's going to require surgery and a lot of rehab, but anybody, or any dog, that's active is probably going to injure themselves at one point or another. So preventing injury is probably not realistic, but reducing the risk of injury, reducing the chances that the dog will injure themselves, I think there are a lot of things we could do about that. In my webinar we talked about thirteen of those, and I think the things you asked about — conditioning, warm-ups, and cool-downs — are very important. So while we don't have any good research to back it up, I think we can all agree that those things are important to help reduce the risk of injuries. Melissa Breau: Are there things that handlers can do before the dog injures themselves, while their dog is healthy, to prepare themselves and their dogs for that possibility of injury in the future? For example, I'm thinking that it might be useful to have video of a dog moving through their gaits, things like that. Sue Yanoff: I think the idea of having video of your dog is a really good idea, and I had not thought about it until you asked about it. In my class that I teach, I often ask the owners to send me a video of their dog, not just moving but just standing. What does your dog look like when they're standing still? It would not hurt to have a picture of that. As far as a video of the dog moving, I think that's a great idea. Often, in my class, I ask my students to send me a video of their dog moving. And what I want to see — I want to see them moving at a trot, because that's the easiest gait to evaluate because it's a two-beat gait, so it's an even gait, so it's a lot easier to see if something is off than if the dog is running. I have them show me the dog trotting from the side, trotting past the camera, and then I want to see video of the dog trotting from the front and from the back. When I'm evaluating a dog in real life, this is what we look at. We watch them trotting past us, we watch them trotting away from us and trotting towards us, and then we also watch them trotting in a circle going in both directions, because there are many cases where the dogs are normal when they're trotting in a straight line, and then you start moving them in a circle, where they're putting a little bit more weight on the inside leg compared to the outside leg, and then you see something that's a little bit off. So I think video is a good example. I'm going to start adding that to anything when I talk about injury prevention. The other thing that I think is good for people to do is to get your dog used to being handled. When I do a sports medicine exam, I carefully handle every bone and joint in all four legs, and then I manipulate the neck and palpate the back and the tail. Most of the dogs I see are pretty good about it, but I've had a few dogs where I cannot touch them, or I can barely touch them, because they're either antsy or scared or aggressive. We take a lot of time to work with the dogs to get them calm and used to us, but there's a handful of dogs that we just can't handle. So I think it's good to get your dog used to being handled, and especially get your dog used to laying on his side or her side, just lying still and getting used to being handled. Deb Jones teaches a really good class for FDSA called Cooperative Canine Care, where she basically teaches you how to get your dog used to having a lot of different things done to them. I'm not sure if laying down is one of them, but you can use the same principals of shaping to get the dog used to that. So I think that's important. The other thing that's important, at least for me as a veterinarian who is trying to evaluate your dog, is to teach your dog to trot on a loose leash, because again, when I'm evaluating the dog, it's very difficult to evaluate the gait when the dog is pulling or jumping up and down or running and just won't do a nice trot. As we say in the conformation world, a nice up and back trot. Surprisingly, our dogs are very well trained, but this is a skill that if you don't need it in any sport that you're doing, then you might not train your dog. The other thing that's hard is sometimes dogs that do a lot of obedience, even agility dogs, they won't trot looking straight ahead. They're always looking up at the owner. And again, that makes them more difficult to evaluate because it throws off the front leg gait, so it's harder to tell if something's wrong. So having your dog used to being handled, teaching your dog to walk on a loose leash, it also would help for you to know what your dog's muscles feel like normally. If you know that your dog's muscles are normally pretty supple and soft and not tense, and the dogs don't mind you manipulating the muscles, then that would come in handy if one day you're petting your dog and you notice that there's an area of the muscle that's very tight. And again, coincidentally enough, or conveniently enough, Lori Stevens teaches a Fenzi class on canine massage, where she's not specifically teaching you to palpate the muscles, but if you're massaging your dog's muscles, you really get a good feel as to what the dog feels like normally, so if there's something off, then you would know it. The fourth thing is to know what normal range of motion is for your dog. When we talk about range of motion for joints, we're talking about flexing and extending them and moving them around to know, again, what's normal. So one day, if you're stretching out your dog's shoulder and it doesn't go nearly as far as it normally goes, or if the dog fusses at you, or struggles when you try to extend the shoulder, then you'll know right away that that's not normal for your dog, and it might make you think, Hmm, maybe I should get this checked out. That's about it. It's a good question, and there are things that the handlers can do for their dogs at home. Melissa Breau: So you've got both a workshop and a class on the schedule in the near future. Both are related to the stuff we've been talking about. Would you be willing to share a little bit what is each one about? Who are they for? What should people know? Sue Yanoff: The workshop — it's my first workshop, and what I was talking about of knowing the range of motion of your dog's joints, because the workshops are fairly targeted to teach a specific skill, the workshop is titled "What's Right With My Dog." Because we always say, "What's wrong with my dog?" and sometimes you can't know what's wrong with your dog until you know what's right with your dog. The workshop will give … I'll teach a little bit of basic anatomy, skeletal anatomy, and teach people what range of motion is, and then show people how to do a basic orthopedic exam, a musculoskeletal exam, on their own dog, how to put the joints through their range of motion, how to feel along the spine to see if there's any pain. It's obviously not going to make anybody a veterinarian, but it will give you just a basic idea of the bones and the joints, what's normal, what's not normal, and how to evaluate it on your dog. As a veterinarian, I have to be able to examine lots of different dogs and determine what's normal and what's not normal. But for most owners, you only need to know what's normal for your dog. So if you know what's normal for your dog, and you know how to do some basic joint range of motion, then, as I said before, when you're handling your dog's muscles and massaging your dog's muscles, you get used to your dog and you know what's normal for your dog. So if one day you go, Hmm, that's not normal, you don't really have to go any further than that. You don't have to make a diagnosis or know why it's not normal. You just have to know it's not normal. It's the same with putting the joints through their range of motion. You don't have to know what's wrong, what's causing the change. If you find a change, and as we talked about earlier, you think your dog's not quite right, but you can't see any lameness and you're not really sure if something's wrong, if you're doing these range of motion exercises and you go, Hmm, that's not normal, that's all you really need to do as an owner is know something's not normal, and that might lead you to pursue further diagnostics. Melissa Breau: And what about the class? Sue Yanoff: The class is Canine Sports Medicine, and that goes into a lot more detail about the things we talk about in the workshop, and a lot more besides that. The workshop is good for really anybody that wants to know a little bit more about their dog and how to know what's normal for their dog. The class is … there's a couple of different groups of people who would be interested in the class. I've had veterinarians and physical therapists and veterinary technicians and other health professionals in the class, and they're taking it just for information, so they will get a lot of information. Then, I think the people that probably get the most out of the class, as far as most bang for their buck, are people who have dogs that actually are injured now, and they're either working through it with their veterinarian, or they've been to two or three veterinarians and their dog isn't getting better, or they are going for physical therapy and they're doing all these different modalities and their dog's not getting better, or nobody can figure out what's wrong with their dog. Then we have six weeks to work through what happened, what the history is, what are you seeing, show me a video, can you feel this, what does this feel like. And while I can't make a diagnosis and recommend treatment online, I certainly can walk them through different steps and ask them questions and help give them information as to what they should ask the veterinarian or the healthcare provider that they're seeing that might help us get a correct diagnosis and on the path to correct treatment. You know, we have a lot of geeks in Fenzi, and there are some people — we talk about training geeks and other types of geeks — but people that just want a lot of detailed information that's given to them in a way they can understand. You don't have to be a veterinarian or veterinary technician to take the class, because I make things … I don't dumb it down and make it silly, but I make it understandable to most people, so they'd be able to understand it. So even though their dog might be injured now, if the dog's going to be injured in the future, it will give them a good idea of what they need to know and what they might have to ask their veterinarian, and whether or not they should see a specialist, things like that. I also just mentioned that the sample lecture on the website is a lecture on reducing injury risk in dogs. It's the same information that I gave in my webinar, although the webinar went into a lot more detail. But that information is the last lecture in the class, but it's also available free to anybody who wants to go read it. Melissa Breau: Awesome. Is there anything else folks should know about the class? Sue Yanoff: No, that's about it. I think the most important thing for people to know, which I preach all the time, is if you think there is something wrong with your dog, there probably is, and you have to pursue it as far as you need to. I think most Fenzi students are very good about being their dog's advocate and pursuing things. They might not know how to pursue it or where to go next, so that's something the class can help them with. But the important things are to diagnose the injury early, get an accurate diagnosis — I'm constantly harping on my students, "Well, what's the diagnosis?" Because they're seeing a lot of different veterinarians and the dog's lame, but nobody has really given them a diagnosis. So catch the injury early, get a correct diagnosis, treat the dog properly, and sometimes there's a couple of treatment options, but sometimes there's really one option that's the best. So treat correctly, and then rehabilitation, I think, is very important in all dogs, not just sports dogs. I think rehabilitation is a very important part of the recovery process. As a surgeon, my job is to do the surgery, fix it, but that's not the end of it. I think the rehab process is just as important as the surgical procedure. So that's important. And then the final step to getting your dog back to competition is, after the treatment, after the rehab, you have to take a period of time to gradually return your dog to training before you can get back to competition. So I think those are all important things to know. Melissa Breau: Just to give people listening a heads up, the class opens for registration on March 22, and the workshop, which is not on the website yet … I don't think it will be up by the time that people are hearing this, but it will be up shortly thereafter. The workshop opens for registration on March 25. I don't have the dates the workshop starts in front of me. Do you know them offhand? Sue Yanoff: The first lecture video will be April 3, and then I'll do the evaluations on April 10. The other thing I want to say about the class is there are no Gold spots in the class. It's just Silver and Bronze, but the Silver students are basically treated like Gold students, and they can ask any question they want, and they can also ask any question they want about any of their dogs, not just one dog. They can post photographs, and if I ask for them, they can post videos. So the Silver students get a lot of personal attention. Melissa Breau: That's awesome. I've got one final question here for you that I've been asking everybody, and that's, What's a lesson that you've learned or been reminded of recently when it comes to dog training? Sue Yanoff: I thought about that question because I know you ask it in all the podcasts. I guess the thing that I've been reminded of lately, because I'm working through this with my dog now, trying to get her ready to show in utility, and that is reducing reinforcement to get the dog ring-ready. I know there are a lot of classes on this, and I know it's an important subject, but I didn't do it quite right, and so now I have a dog who is trained through utility and knows all the exercises, but I can't get her through a class at a trial because she knows the food's not coming and she's not happy about it. So I think reducing reinforcement — it's best to do it right the first time, rather than have to go back and fix it later. Melissa Breau: Thank you so much for coming back on the podcast Sue! This has been great. Sue Yanoff: Thanks for having me, Melissa. Good talking to you. Melissa Breau: And thank you to our listeners for tuning in! We'll be back next week, this time with Barbara Currier to talk about agility contacts and training with teeters.